What new intentions do you have for this coming year? 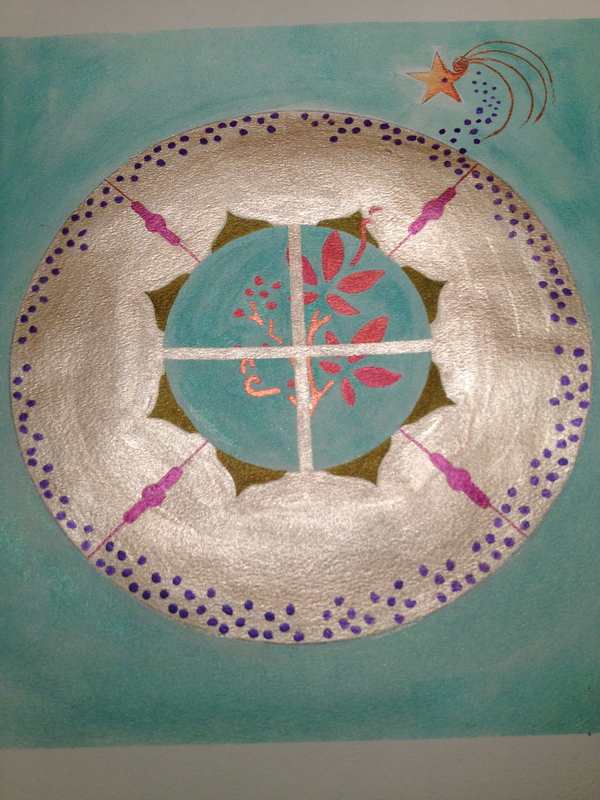 Rather than make a list of resolutions meant to broken, create a powerful visual reminder that 2013 offers four seasons and twelve months of hope, healing and joy in the form of a mandala or sacred circle. This mixed media project will include watercolor and permanent markers, with lots of creative options to make your mandala express your life’s journey this coming year. No artistic background required. All materials included. To be honest, I wasn’t completely sure what I was signing up for, but I was drawn by the idea of this new use of an ancient tradition for creating a visual road map of the year ahead. No artistic background required. All materials included. I had nothing to lose and everything to gain. We met at 10 o’clock on a very cold, cloudy and windy first Saturday in January. Eight women and one brilliant facilitator. The class was held at Via Artistica, a light, bright and very inviting space dedicated to supporting creative expression for people at all levels of artistic experience. Kristen Carpentier, who created and facilitated this workshop has helped hundreds of women (and a few brave men) use art as a way to explore and promote personal growth. This woman has a gift and I for one am very glad she has chosen to share it with the world! We had a real Artists in the group which I always find intimidating, but I got over myself pretty quickly and on to the business of quieting my judgmental monkey mind and letting whatever bubbled up work its way onto my watercolor paper. 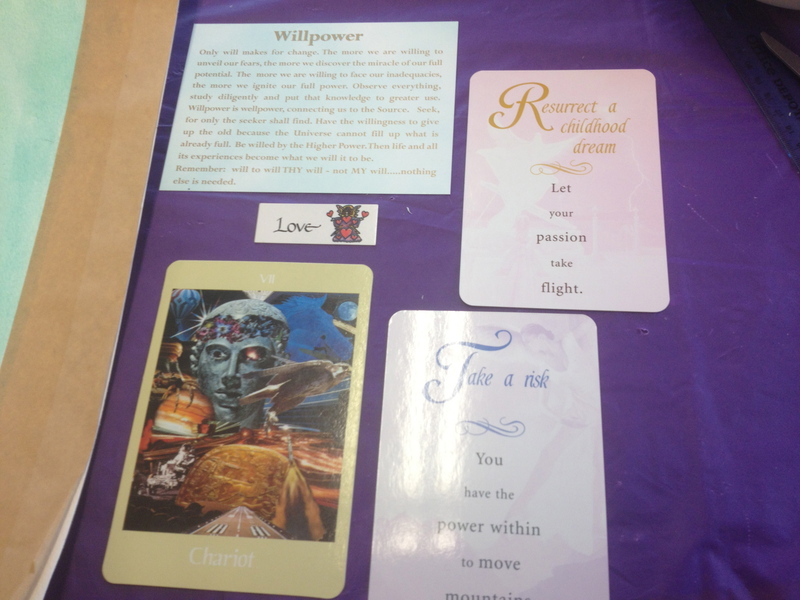 We drew cards for direction – I randomly chose Risk and Passion and Willpower Right on target! Mandala is a sanskrit word for circle and creating mandalas is a Buddhist form of meditation that is hundreds of years old. If you are interested in learning more about the Mandala, its history in Buddhism and other ancient traditions, here’s what Wikipedia has to say . 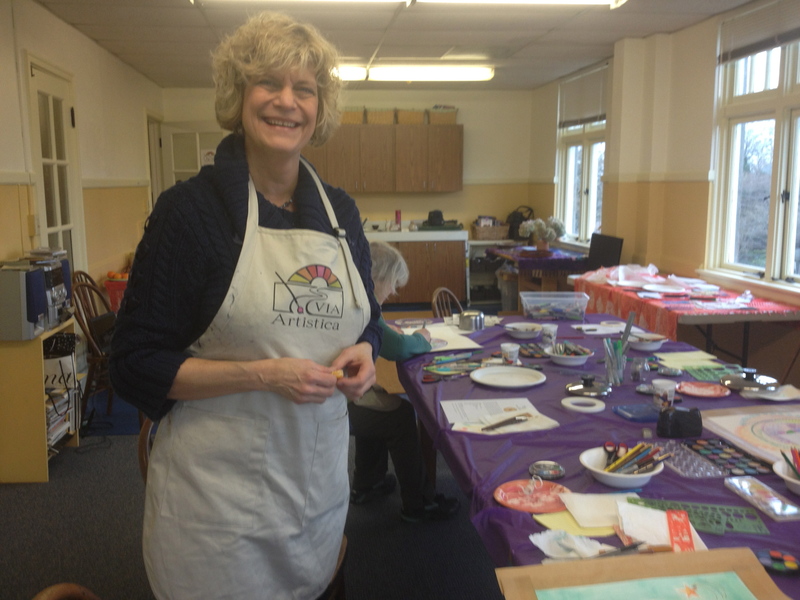 For this workshop, the guidelines were simple, the supplies plentiful and the paints sparkly and colorful. We started with a big square of paper, a dinner plate to trace the mandala circle and then played for the next two hours and watched as magic happened around the table. I had no idea where I was going when I sat down at the table, but I have to say I absolutely love what I created. Creating the space for reflection, setting intention and then sharing in a supportive group is a great way to start a new year, or a new month, or a new plan of any kind. There will be more mandalas hanging on my wall in the year ahead. Thanks Kirsten and Via Artistica.